4 February 2015, at 9:15a.m. US - Aviagen’s Dr Gregorio Rosales has been honoured by the US Poultry & Egg Association for ‘sustained and exemplary service’. Aviagen, the world’s leading poultry breeding company, has announced that Dr Gregorio “Greg” Rosales, the company’s vice president of veterinary services, has earned this year’s Lamplighter Award from the US Poultry & Egg Association (USPOULTRY). 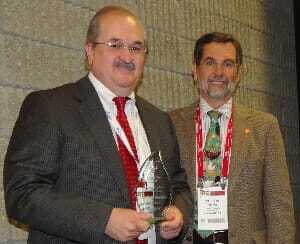 Dr Rosales received the award in Atlanta this week in a ceremony at the 2015 International Poultry and Production Exhibition (IPPE). He was recognised for “many years of sustained and exemplary service” to USPOULTRY’s Foundation Research Advisory Committee, which annually helps determine who will receive hundreds of thousands of dollars in research grants. Over the years, Dr Rosales has served on an array of USPOULTRY committees as part of a lifetime spent advancing efforts to make poultry the world’s leading source of affordable, healthy and sustainable animal protein. Kevin McDaniel, president of Aviagen North America, said: “You’d be hard pressed to find someone who knows more about avian medicine than Greg Rosales – and even harder pressed to find someone more committed to applying that knowledge in ways that benefit the industry as a whole. Born and raised on a broiler farm near Mexico City, Dr Rosales said: “It’s a great honour to be recognised by my colleagues at USPOULTRY, whose foundation does important work that advances the cause of avian health and supports the crucial contribution poultry makes in a world looking for safe, affordable food sources. In 1979, Dr Rosales received his DVM degree (Valedictorian) from the National Autonomous University of Mexico and also earned an MS degree from the University of Georgia in 1983. He returned to his alma mater in Mexico City and served as an Associate Professor and Head of Poultry Diagnostic Services at the College of Veterinary Medicine until 1985. Dr Rosales returned to the University of Georgia and earned a PhD in 1988. He then served as Director of Technical Services for Indian River International in Nacogdoches, Texas. In 1991, he joined Ross Breeders, now Aviagen Incorporated, and served as a Staff Veterinarian, Director of Veterinary Services, and since 1997 as Vice President of Veterinary Services. Dr Rosales has also authored or co-authored several reports in refereed journals, a few chapters in books or manuals on avian diseases, and numerous publications on biosecurity and disease prevention and control in various trade journals and conference proceedings in the United States and Latin America. He has been a member of numerous professional organizations and has served on various committees and boards. Last week at IPPE, Aviagen highlighted its theme, 'Global Reach Local Touch'. The company shared with IPPE attendees the latest information on best management practices, field trial performance, innovative R&D technology and techniques, new products and other improvements that will impact poultry performance, bird health and welfare in the future.